Ideal for beginners: hand-finished pure badger shaving brush with imitation ivory handle. This soft hair is very fine and the most commonly used in shaving brushes. Height: 9.5cm. Weight: 1.5 oz. Made in England. The Shaving Brush should be run under warm water and shaken so that the brush is wet but not saturated when placed onto the shave soap or cream. A good lather is obtained using a circular motion on the soap, without too much pressure. The face should then be massaged with the shave brush to stimulate the hair. After use, the shaving brush should be rinsed well in warm, then cool water and shaken vigorously. The brush should then be wiped on a dry cloth, fluffed out and left in a well ventilated place, ideally hanging upside down in a shaving brush stand. 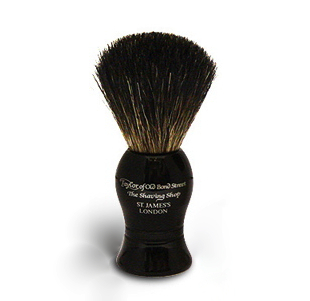 A well kept shaving brush will last for many years, and give good service throughout its life.